Not long ago, oxtail was difficult to find and being discarded in American markets (can you believe that?? ), but people have come to their senses and realized what a delicious part of meat oxtail is. In addition to being delicious, due to the amount of collagen and marrow, it is rich in minerals that are good for your joints, skin, and stamina. Today's recipe is based on my mom's oxtail soup, which would be my choice for last meal on earth, that is how much I love this dish. This dish is not something you can make and eat on the same day, so keep in mind you need to prepare this at least a day ahead. You can shorten various steps, but I will lay out all the steps as is, and you can make the recipe your own. I usually buy oxtail in Korean markets, since it is affordable and the quality is good. This is how they're packaged. Given a choice, pick the one with bigger pieces. First step: Draw the blood out by immersing oxtail pieces in a big bowl of water. Let it sit for 2-4 hours and the blood will gradually seep out of the bones and the meat. If you don't draw the blood out, the meat can be tough. Change the water once or twice. If you don't have time, at least do one hour. Update (4/17/15): Unless you're making a very large quantity, it is sufficient to soak it in lukewarm water for about 30 minutes. Just change the water a couple of times. Hopefully this will shorten the prep time a little bit. Second step: Boil the oxtail in a pot of boiling water for 5-10 minutes to remove additional scum and impurities. Discard the water and wash the oxtail under running water. Wash and rinse the pot, if necessary. I believe this step is similar to making pho. Third step: Place oxtail in a big pot of water and bring to a boil. Once it comes to a boil, lower the heat. Simmer the pot on low heat for 4-6 hours minimum, longer if you have time. I cooked mine for 8 hours or so, but it depends on the size of the oxtail, quantity and amount of broth. Test the meat and if it is tender, it's done. For the last couple of hours, you can add an onion or Korean radish in the broth, since this lightens the broth and minimizes the gamey flavor of the meat. Fourth step: When the pot has cooled, remove the oxtail from the pot and set aside. Put the pot of broth in the refrigerator for a few hours. This will separate the oil layer and it will be easier to remove most of the oil from the broth. Keep in mind that when oxtail soup gets cold, it will become gelatinous due to all the collagen. Oil is the upper layer of this gelatinous mass you will see. This step is not imperative; you can use a ladle to scoop out the oil as you are cooking, but my mom always does this, so I do it too. That stuff from science class that said water and oil don't mix? So true. Fifth step: After you have discarded most of the oil, bring the pot to a boil again and place the oxtail back in. If there is a little oil still, make sure you remove that to get a clean broth. The broth should be milky from all the minerals from the bones and meat. Once the pot heats up, you are ready to eat! Chop up green onions and set the table with salt and pepper. Ladle the soup into individual bowls, and everyone seasons their own bowl of soup. Gradually add salt, since you can always add more but it's hard to take away if it is too salty. Don't be surprised if you need a teaspoon or so, I like mine a little on the salty side. Oxtail soup is usually eaten with kimchi, since the taste of pickled spice is a perfect complement to heavy, rich broth. Hopefully you have some in the fridge! If you prefer, you can cook some noodles and include it in the broth. The clear noodle is called dang-myun, but you can also use somen. 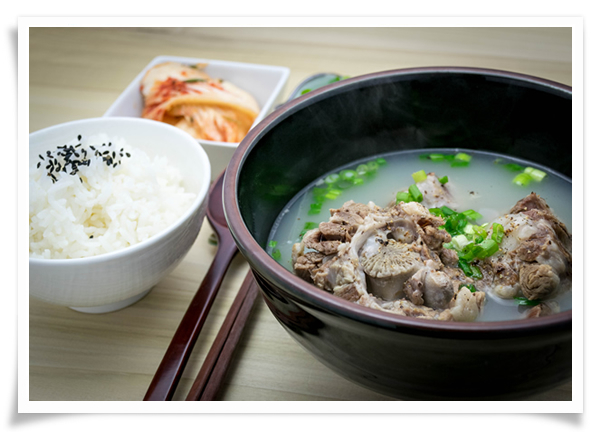 There are a lot of similarities between another beef soup called sullungtang and oxtail soup. Sullungtang uses different parts and bones, wheras oxtail soup just uses, you guessed it, oxtail. If you've had sullungtang at a restaurant, you can imagine how oxtail soup can be just as hearty, delicious, and flavorful. Now can you see why oxtail soup says love? All that effort, time, and care into one bowl of soup. And you thought chicken noodle soup was all you needed when you're sick.... #mymomssoupisbetterthanyours. Enjoy!